Jason Briggs: porcelain, etc. 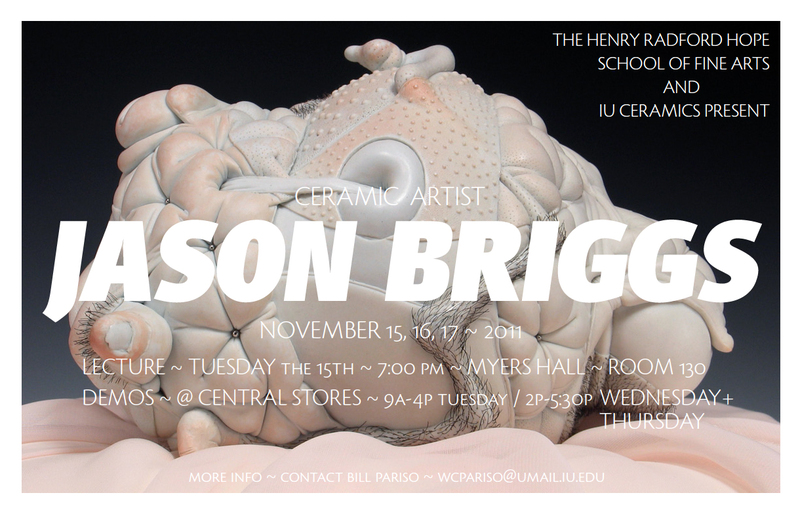 Indiana University • Jason Briggs: porcelain, etc. i met at least 30 high-quality individuals. only 1 schmuck. (just kidding David.) IU is top-tier all the way. i love talking to people who get it. Bill Pariso (grad and fellow Whitewater alum) made things comfortable and charming. also big thanks to Visiting Faculty Ian Meares, who is without question the smartest person on the face of the planet--and a pretty good dude too. during the week i did crits with nearly every single grad, post-bac, and BFA. that's a lot of b.s. coming out of this mouth. huge thanks to the faculty for being involved and interested: Tim Mathers, Malcolm Mobutu Smith, and Christyl Boger. great people.